Happy New Year everyone! May you eat well in 2014! 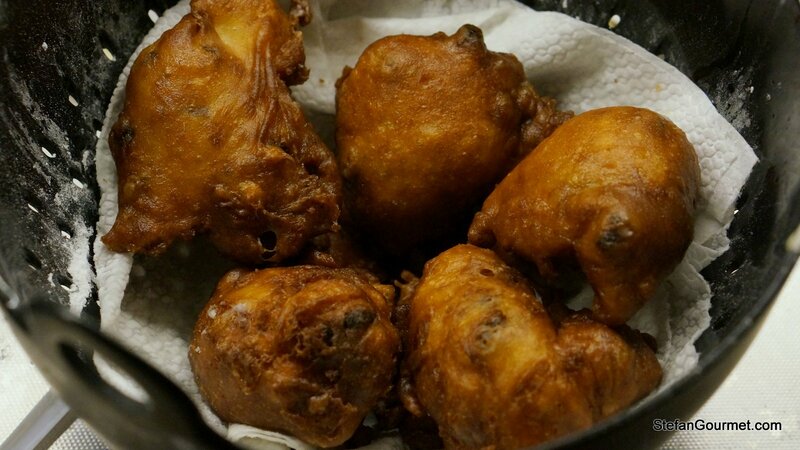 On New Year’s Eve we eat oliebollen (literally: “oil balls”) in the Netherlands. Oliebollen are deep fried yeasted batter, often filled with raisins. They have been prepared in the Netherlands for centuries, and can be seen for instance on paintings from the 17th century. They can be thought of as a form of donut/doughnut, but better (in my opinion). 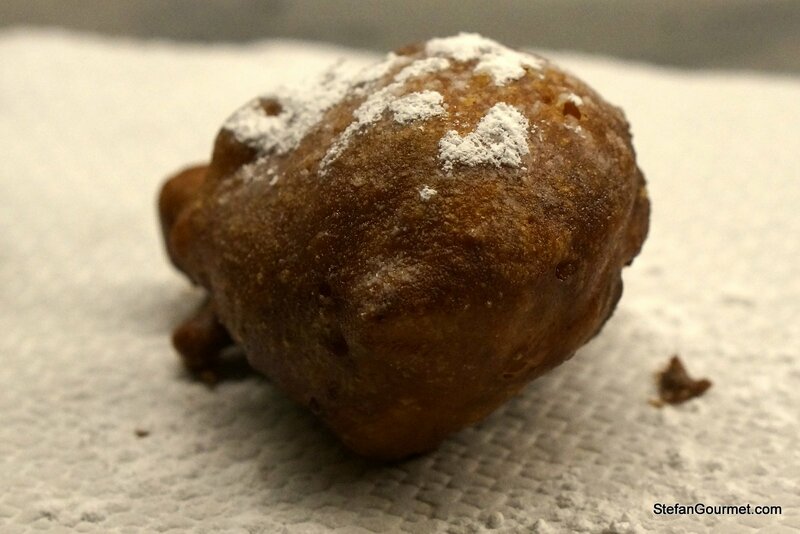 Oliebollen may in fact be the origin of American doughnuts. Oliebollen are served at almost every New Year’s Eve party in the Netherlands. They are available from pastry shops, supermarkets, and street vendors, and many people also make their own. 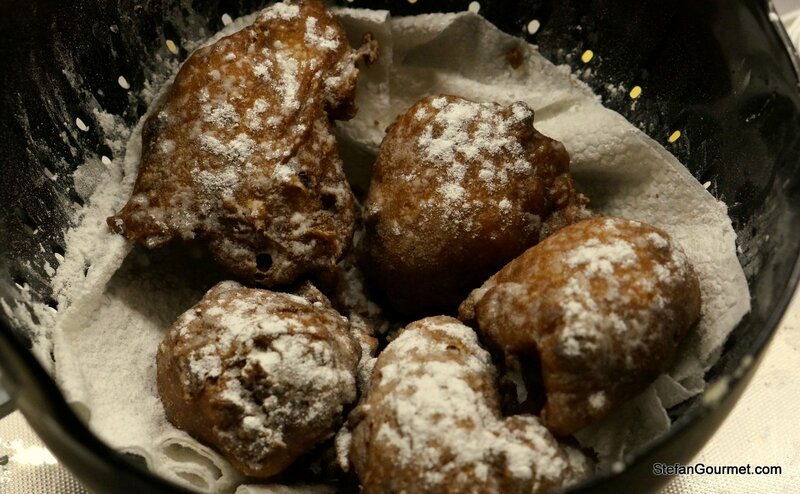 Although the recipe is of course also important, for me by far the most important factor is that oliebollen should be eaten fresh, right after they have been fried and as soon as they have cooled off enough that you can eat them. Cold oliebollen or reheated oliebollen are chewy and greasy. Fresh oliebollen are crispy and tender. I went to a New Year’s Eve party last night, and said that I would provide the oliebollen. When I arrived, I was asked several times where the oliebollen were. I pointed at crate with ingredients, a stand mixer and a deep fryer I had brought, and explained that I would start preparing them by 9:30pm or so, so freshly fried oliebollen would be available around midnight. My recipe is pretty straight-forward. 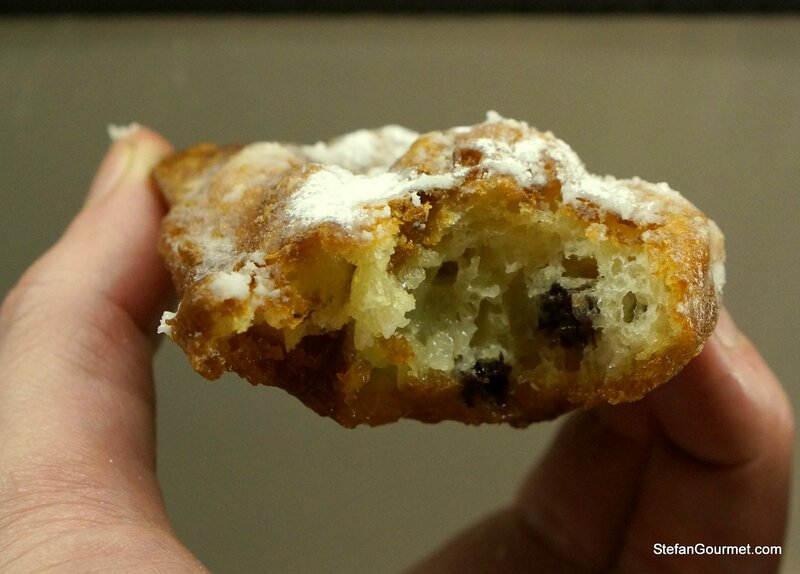 I like oliebollen to be stuffed with raisins, currants, and small pieces of apple. The only ‘special’ ingredient I add is a bit of lemon zest. 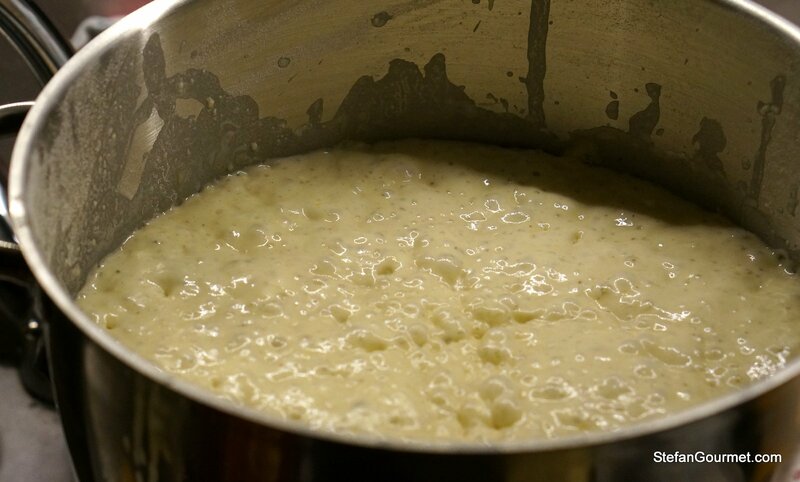 Heat the milk to lukewarm in the microwave (about 30ºC/85ºF) and crumble the yeast into it. Add the sugar and stir to dissolve the yeast into the milk. 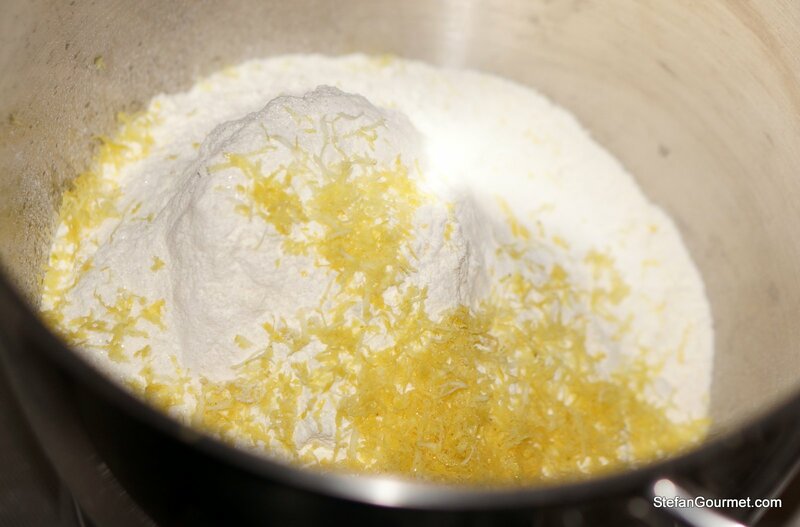 Combine the sifted flour, salt, and lemon zest in the bowl of the stand mixer fitted with the paddle attachment. Process briefly on low speed to mix. 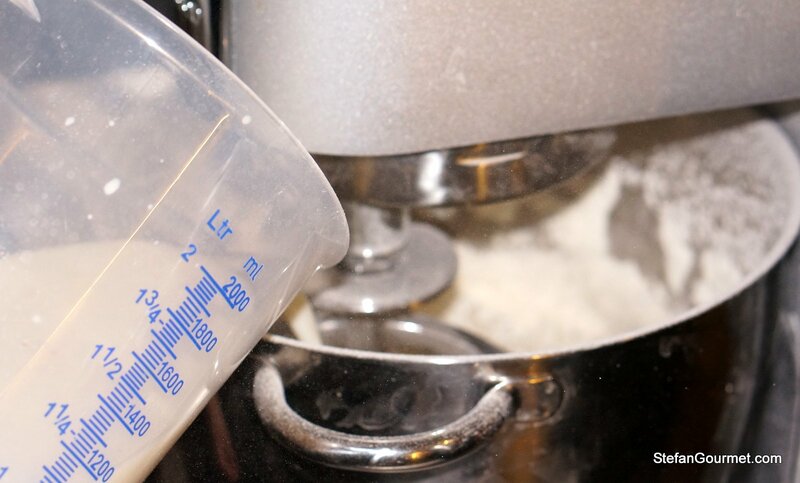 With the stand mixer running on low speed, very slowly add the milk. 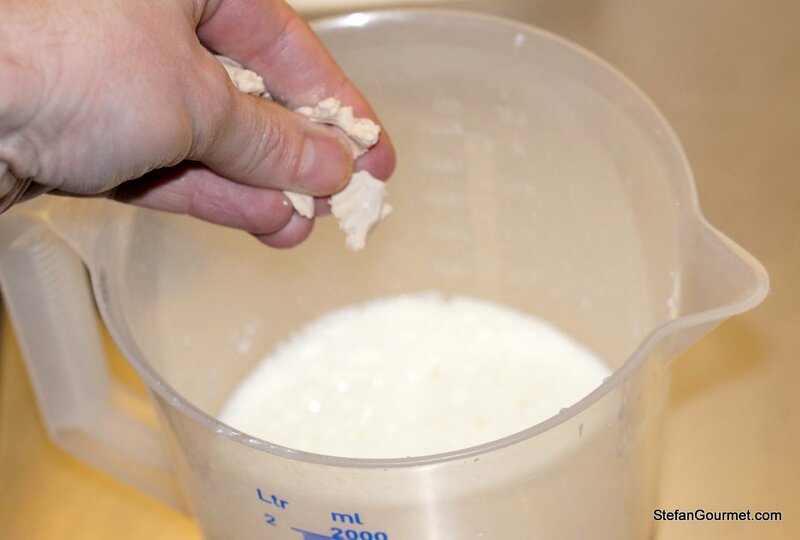 By adding the milk slowly, lumps are avoided. Add the egg as well. 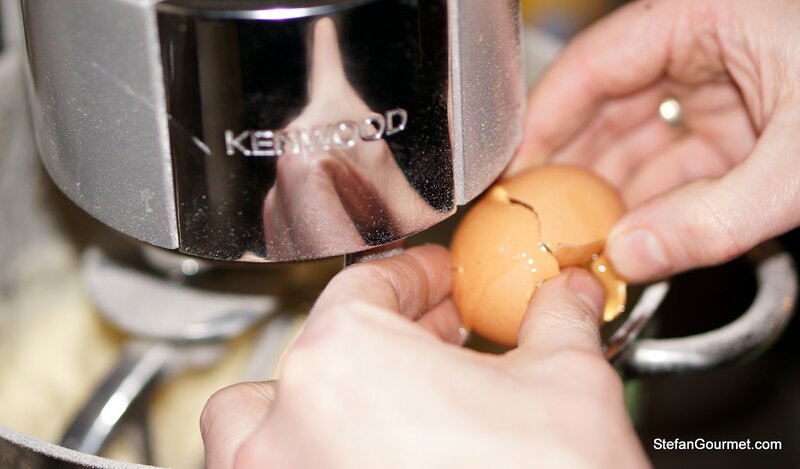 Turn the machine off once the batter is completely smooth. Core, peel, and dice the apple, and add to the batter. Add the raisins and currants as well. 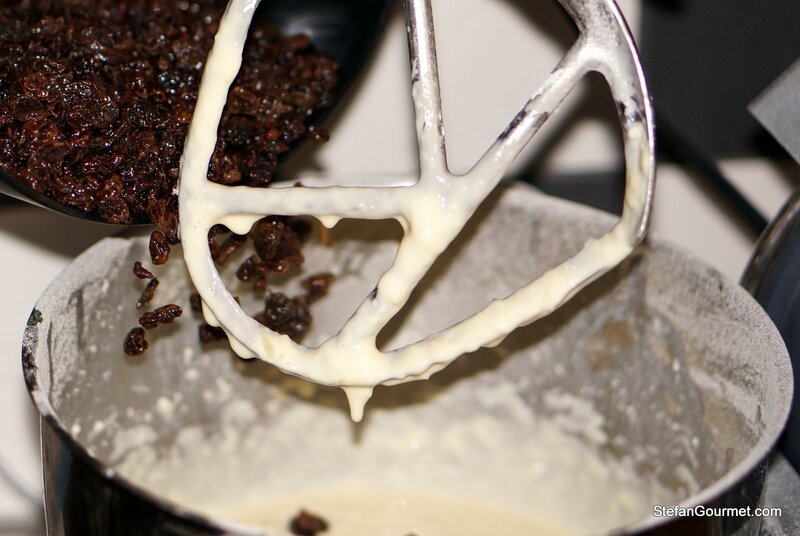 Process briefly to incorporate the apple, raisins and currants into the batter. Cover the bowl with a towel or plastic wrap, and allow to rise at a warm place for about an hour. The batter should have doubled in volume. 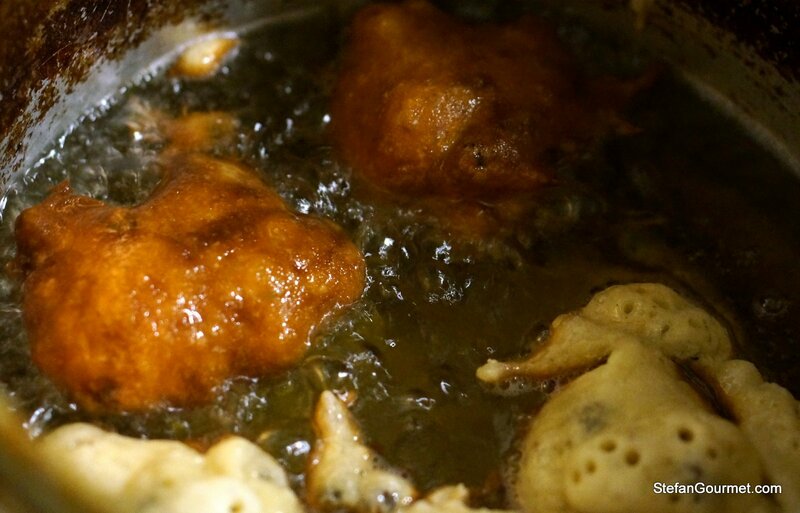 Heat the vegetable oil to 180ºC/350ºF; this is easiest in an electric deep-fryer. 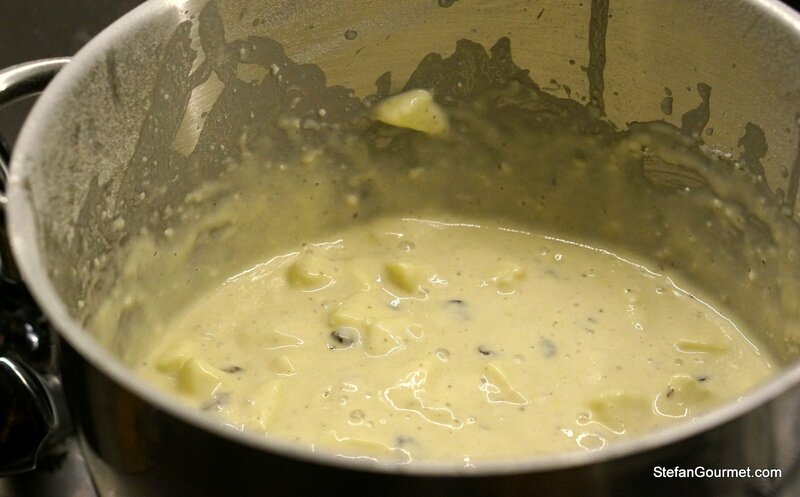 Gently lower a scoop of the batter (about 3 Tbsp) into the hot oil once the oil has reached the proper temperature. Repeat four more times, so that five oliebollen will be sizzling in the hot oil. 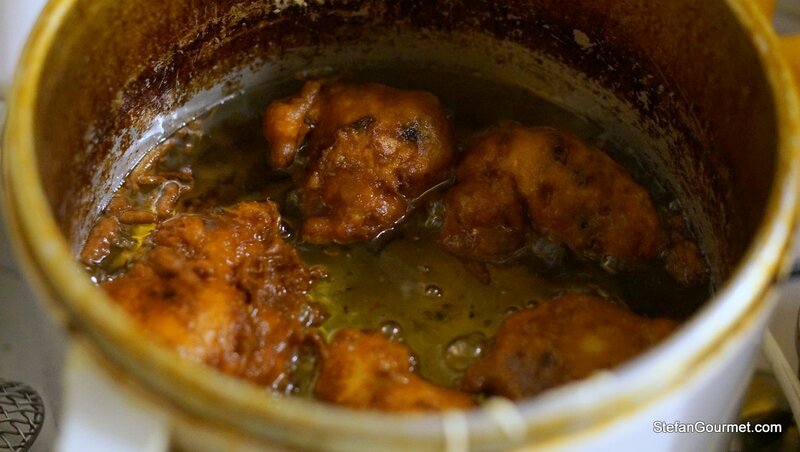 It is important that the oil stays hot, so do not fry more than 5 oliebollen at once and always wait until the oil gets back to temperature before adding new batter. After a few minutes the oliebollen will be golden brown on the one side and need to be turned so the other side can be cooked as well. After a few more minutes the oliebollen are cooked and will be golden brown all over. 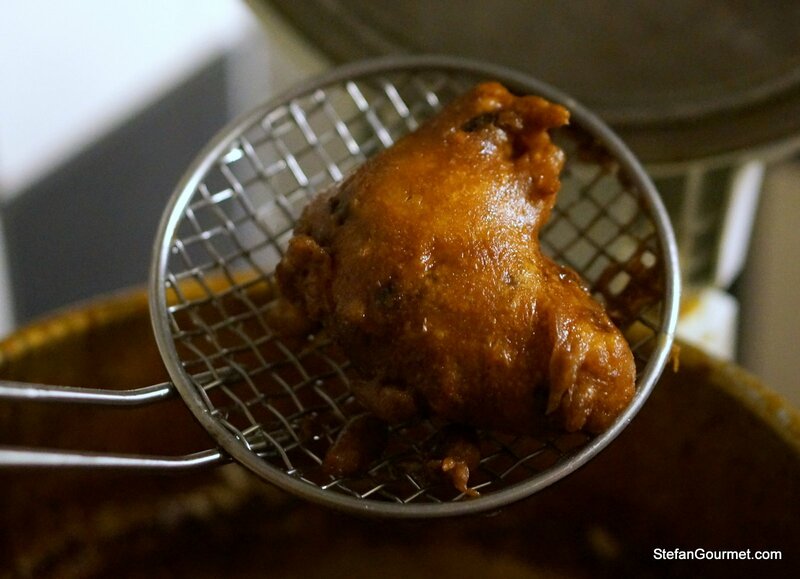 Lift the oliebollen out of the oil with a skimmer. Allow the oliebollen to drain and cool a little in a colander lined with paper towels. 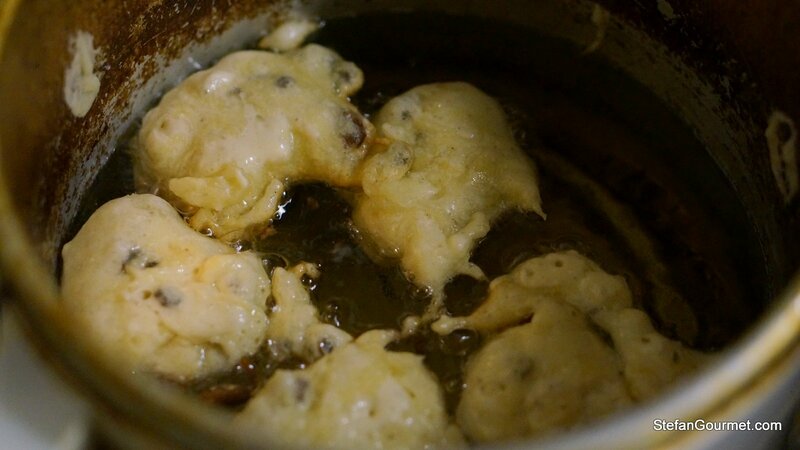 You can lower a new batch of oliebollen into the hot oil while the previous batch is cooling off. Sprinkle generously with powdered sugar just before serving. Eat the oliebollen as soon as possible! It is just as traditional to have oliebollen for New Year’s as it is to have champagne. Unfortunately, crispy dry champagne and sweet greasy oliebollen are not a good match. I prefer to have Moscato d’Asti with my oliebollen. It is just as festive, is a lot cheaper and tastes better than cheap champagne to boot. Those look amazing – very similar to the Slovak shishky. Happy New Year from Texas! I have never heard of Oliebollen (oil balls!). 🙂 Of course yours even have a scrumptious wine pairing. They sound delicious when fresh – and a wonderful Dutch tradition. American donuts have a very proud fried dough uncle, I see. You really are a full service shop to make them fresh, to serve until midnight. Now your friends are going to put you to work every year! Happy New Year, Stefan! P.S. For Hanukkah, we make something similar – sufganiyot. The only difference is that there are not generally raisins and jam is often put in the center of the doughnut hole. Powdered sugar on top is a must, of course! Hi, Stefan. Happy New Year to you and Kees. 🙂 The oliebollen look beautiful. They are similar to what we call apple fritters and I imagine very, very tasty. Oh my those look so good. Please stop. I need to go on a diet, and you keep making me want to make pancakes and fritters!!!!! Happy new year! You know how I think about dieting — you can still have pancakes and fritters, just not more than one 😉 Happy New Year to you too, Mimi! That’s because you’re European! Although I am too, by blood. But, no, I can’t just have one! That’s the problem!!!!! 1)	Is it necessary to soak the currants? They will while rising it seems to me. 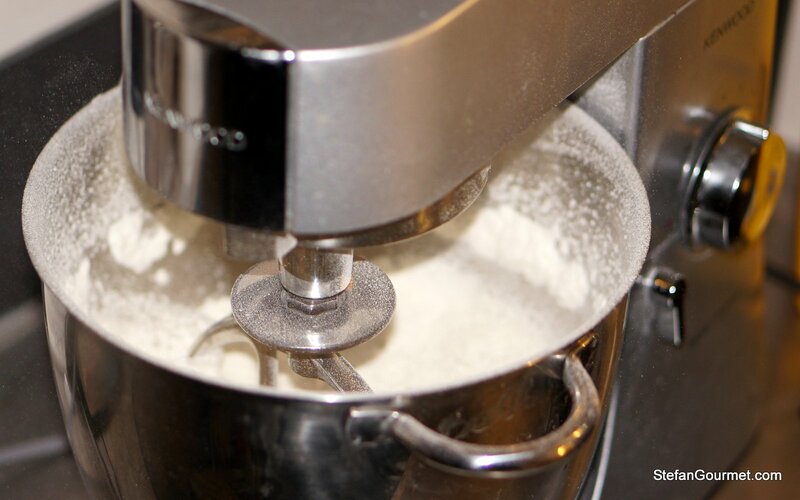 2)	I mixed by hand, and could use my Magimix but I don’t own a stand mixer. What will be the difference between these 3 methods do you think? 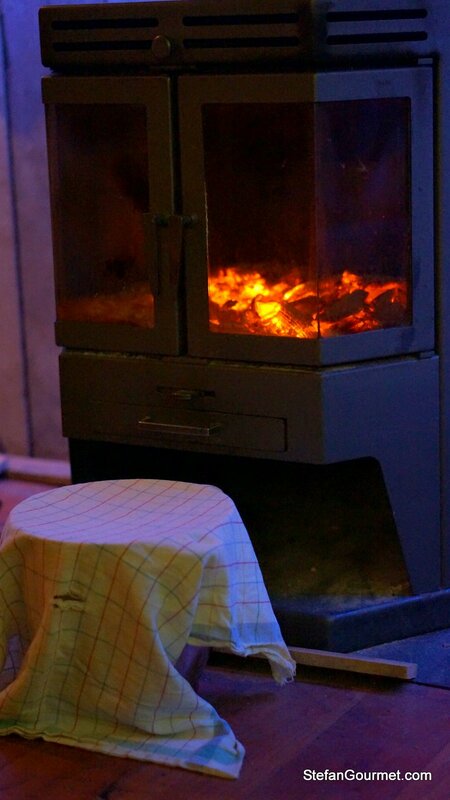 3)	What is the best temperature for rising and why? 4)	Mine turned out with the same shapes and forms like yours using 2 spoons. I noticed professionals use ice cream scoops but they are still not round. Can we not put the batter in 2 hard half round plastic shapes, put them on top of one another and close , vacuum seal this, drop in a warm water bath, and deep fry shortly afterwards? Would improve the taste too perhaps, since the oil can only penetrate the surface. 5)	I do not own a deep fryer and constantly measured the oil temperature with a thermometer. I noticed that the temperature drops by tens of degrees once the 5 balls are in. Therefore I cranked up the temperature, lowered the balls and adjusted the temperature thereafter to 180. A deep fryer will adjust automatically but you could still start at a higher temperature, what do you think? 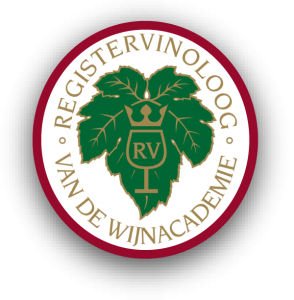 Hi Jeroen, thanks for your very interesting thoughts! 1) I actually wondered about this myself, but I’ve never seen a recipe that doesn’t soak them first. A logical explanation is that the raisins would take up some liquid from the batter, so you’d have to add more liquid to the batter to compensate. Perhaps we should just try it? 2) The magimix is not the most appropriate for the last step as you don’t want to break up the apple and raisins. But more importantly, I’ve never thought using a magimix for yeasted doughs or batters was a success. The dough sticks a lot more than in a stand mixer, and the induction motor (which can do only 1 speed) is not very suitable either. I’ve done it by hand, which I thought was a lot of work! 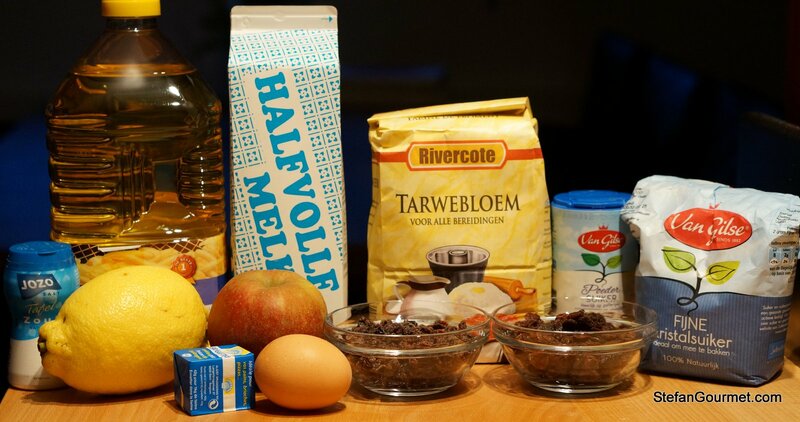 I don’t think there will be a big difference in the end result, as for oliebollen it is a batter that only needs to be mixed, not a dough that needs to be kneaded. 3) That is around 35 degrees or so, which is the temperature that the yeast is most active. When I am at home I will put it in the oven with only the light turned on. It also helps to warm up the milk. Yeast will die above 50 degrees or so. 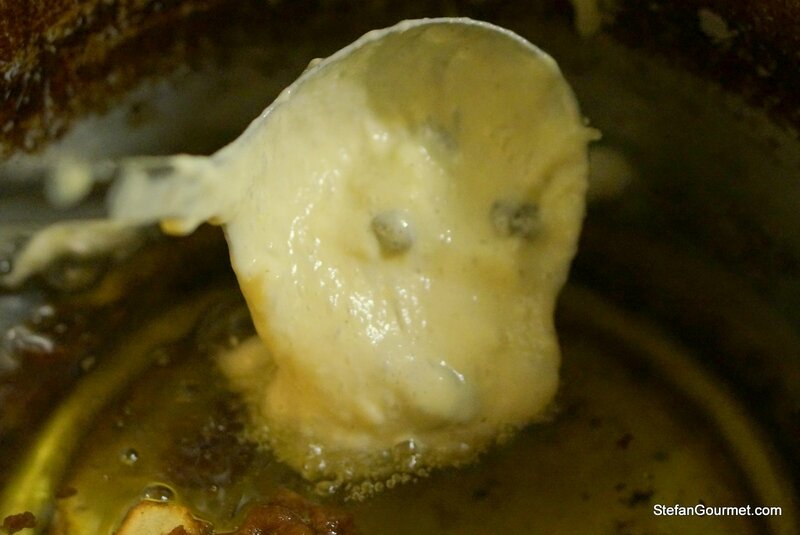 – when you cook the oliebollen in hot oil, the sizzling sound is the sound of water vapor/steam escaping. That water would have nowhere to go in the vacuum bag. 5) I didn’t use to own one as I don’t like to eat deep-fried store-bought stuff for dinner, but I decided to buy one anyway (to surprise of some foody friends) as they are handy and not expensive (20 euros). Anyway, that was not your question. If you want to go above 180 degrees with the oil, you should make sure you use a type of oil that can handle that. Sunflower oil, often used for oliebollen, should not be heated above 180 as it carcinogens will be generated then and you don’t want that. With the oil on a burner, it does help to increase the heat just before you plunge in the batter so it will heat up quickly enough. With the proper oil (like palm oil) that can handle the higher temp, it is a good idea to bring the oil to 190 first. Clear and agree on all points. Maybe I’ll buy a deep fryer too. Nothing wrong and unfoody I would say when used properly. I deep fry regularly myself, e.g. parsnip chips, batata fritters, tortilla chips, boiled eggs Thai style.